Democratic presidential nominee Hillary Clinton opened up in a Humans of New York interview about her time at Harvard University when she was heckled by other students. 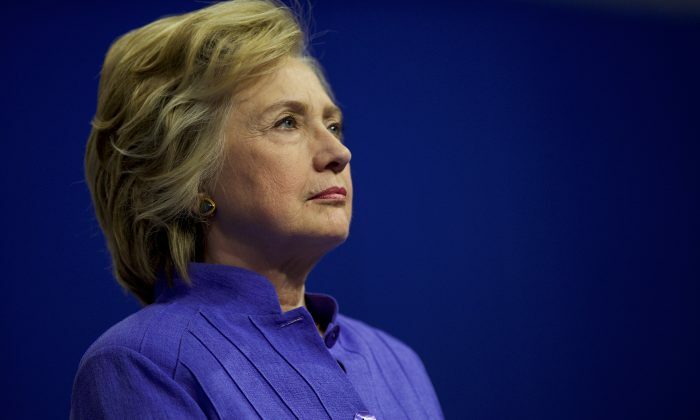 Clinton’s portrait was featured on the popular social media page on Sept. 8. The former secretary of state spoke about when she took her law school admissions test at Harvard. “My friend and I were some of the only women in the room. I was feeling nervous. I was a senior in college. I wasn’t sure how well I’d do,” said Clinton. She then shared an “intense” moment she experienced when she was taunted by male students. “While we’re waiting for the exam to start, a group of men began to yell things like: ‘You don’t need to be here.’ And ‘There’s plenty else you can do.’ It turned into a real ‘pile on.’ One of them even said: ‘If you take my spot, I’ll get drafted, and I’ll go to Vietnam, and I’ll die,'” said Clinton. The former secretary of state said she kept herself composed and tried to not get distracted before taking her test. “I just kept looking down, hoping that the proctor would walk in the room,” said Clinton. She then went on to talk about her image and how she is portrayed. In a second post, Clinton admitted that her husband and President Barack Obama “carry themselves with a naturalness that is very appealing to audiences,” and said she understood how hard they work at being natural. “They work and they practice what they’re going to say. It’s not that they’re trying to be somebody else. But it’s hard work to present yourself in the best possible way. You have to communicate in a way that people say: ‘OK, I get her.’ And that can be more difficult for a woman. Because who are your models?” said Clinton. “If you want to run for the Senate, or run for the Presidency, most of your role models are going to be men. And what works for them won’t work for you,” she added. Women are seen through a different lens. It’s not bad. It’s just a fact. It’s really quite funny. I’ll go to these events and there will be men speaking before me, and they’ll be pounding the message, and screaming about how we need to win the election. And people will love it. And I want to do the same thing. Because I care about this stuff. But I’ve learned that I can’t be quite so passionate in my presentation. I love to wave my arms, but apparently that’s a little bit scary to people. And I can’t yell too much. It comes across as ‘too loud’ or ‘too shrill’ or ‘too this’ or ‘too that.’ Which is funny, because I’m always convinced that the people in the front row are loving it. The posts were shared by ‘Humans of New York’ a day after Clinton and her opponent Donald Trump took the stage at the “The Commander-in-Chief Forum” hosted by NBC News with the Iraq and Afghanistan Veterans of America at the Intrepid Sea, Air & Space Museum in New York.